The archaeological park entered the UNESCO’s World Cultural Heritage Temporary List and has been opened to tourism lately. The monumental tomb of King Hektamonos was discovered in an operation in 2010, and is being uncovered with the efforts of the Ministry of Culture and Tourism. The excavations are complete and the historical buildings are being restored while underground pieces are being further unearthed. The aim of the work is to transform the area into an open-air museum, where visitors are expected to see works of art. Work at the Carian King Hekatomnos' burial chamber and area is led by the Milas Museum Directorate with the consultancy of the scientific council appointed by the General Directorate of Cultural Assets and Museums of the Ministry of Culture and Tourism. Speaking to Anadolu Agency (AA), member of Uzunyuva Excavation Scientific Committee from Muğla Sıtkı Koçman University (MSKÜ) Faculty Member, prof. Dr. Adnan Diler noted that while the region is located in a city center it has been robbed and treasure hunters have damaged the gold leaf paintings and sarcophagus paintings within the tombs. The Carian King Hekatomnos' burial chamber will be on display. Adding that nearly two-meter-thick marble walls were drilled in blocks and used as a passage, Diler said the work carried out in the region was important and difficult. The grave area revealed after the illicit diggings and in the following excavations shows the importance of the mausoleum according to Diler. "The Ministry of Culture and Tourism acted immediately after the robbery and established a scientific council to reveal the real identity of the area. They managed to turn the excavations into a wider and more understandable area," added Diler. The scientific and conservation team formed by the Ministry is continuing to work in the monumental tomb area, The greatest damage during the illegal excavation was to the murals. Diler also noted that the wall paintings were taken under protection to prevent further damage. Water leaking from the holes opened by the smugglers drilling machines damaged the murals and Diler said that an authoritative book about architectural work, tombs, podium and the treasure found by the scientific council was prepared and was being translated. Noting that the monument is similar to the Halicarnassus Mausoleum in terms of its architecture, Diler said, "The 2,400 year old Hekatamnos tomb in the Mausoleum is in the center of the city. The tombs in both capitals were planned by the same architect. This architect is named Piteos. The results show that the tomb belonging to Hekatomnos were left half-finished from the findings surviving up until today. The issues depicted in the murals are related to Hekatomnos. The mausoleum was built on an ancient burial ground. Both were respected as a sanctuary then and afterwards. It reflects the belief tradition of Anatolia. This is a holy gathering place." Efforts have been ongoing since 2010 to create a museum in the area and Diler noted that since it is impossible to enter the grave room, an area will be created in front of the terrace wall to build an underground museum and to display the artifacts. Pointing out that the works are very important for all Anatolian and world classical archaeology, Diler added that with the works in Muğla, for the first time, the art, murals, classical works and architectural works of Hekotomnids can be understood. "While this turns the area into an attraction center, it also reflects cultural continuity as it represents a multi-layered culture. These works of art have given Milas the rightful credentials it deserved in ancient times," stated Diler. Emphasizing that Hekatamnos is the pioneer of the mausoleum, and this had an impact on this area to enter it into the UNESCO World Heritage List, Diler added, "We can even see this with the large terrace wall of the Uzunyuva monument. The entrance gate is completely preserved and we can see the podium. The tomb, which was recently protected from the smugglers, has a very important position. When we consider all these elements, Uzunyuva is one of the most important discoveries of the last 100 years and deserves to be included into the UNESCO World Heritage List both for me and all scientists." Başkent University Faculty Member Uzunyuva Scientific Council Member professor Cengiz Işık said that the history of world archaeology is experiencing an earthquake. 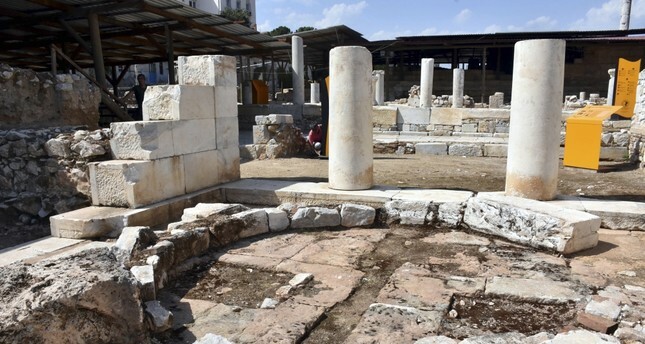 Underlining that the tomb of the Hekatamnos grave and other findings of 2,400 years revealed after illegal excavations presented its importance from the first day, Işık said that the monument is an early example of the mausoleum in Bodrum's Halicarnassos. Noting that they are working to open the area to visitors, Işık noted that a room with the same scale as the tomb room will be built to accept visitors in the area. "We want people to feel like they have really entered a tomb room. Copies of the tomb and murals will be made there. There is an accepted project. Now, the implementation of the project is starting. The links of the cultural chain will be followed in the excavations," added Işık. He also stated that Uzunyuva had great potential for the history of both Turkish and world archaeology. "The information and findings obtained here require that Uzunyuva is included in the UNESCO World Heritage List since it is an example of the Mausoleum, which is one of the seven wonders of the world. We will see this area on the permanent list of UNESCO soon," noted Işık. Işık also added that it will be one of the first sites of choice for both foreign and local visitors as Uzunyuva enters the Permanent List of UNESCO.